Crops grown in the farm are rubber, coffee, areca nut, coconut, pepper, ginger, turmeric, tapioca, yam etc. “Every year we change the crops. Right now we have cultivated ginger and tapioca. Next year it would be some other crop,” he adds. According to Mr. Roy, intercropping is the key to increase their farm yield. “We grow intercrops with every main crop. 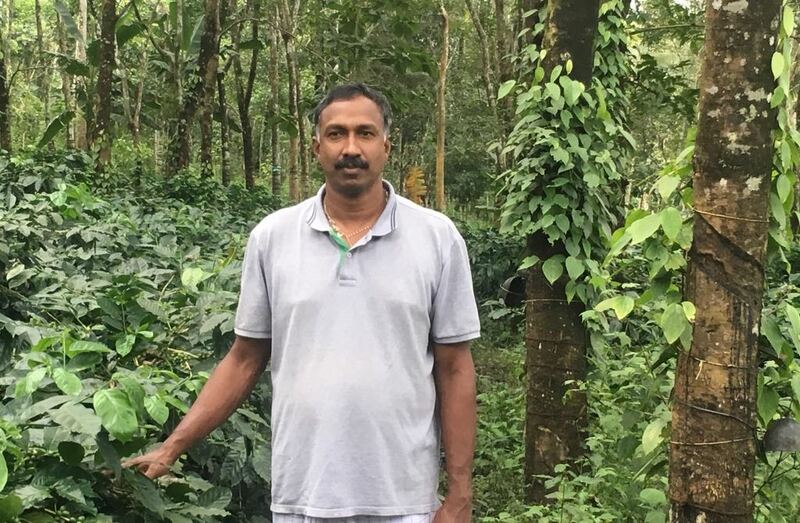 Coffee and pepper are intercropped with rubber and coconut trees, cocoa with areca nut along with pepper. We must depend on crops and not a single crop. 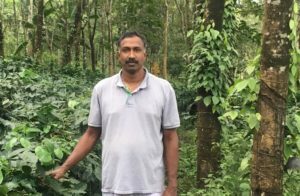 To select the right intercrops the nature and requirement of crops have to be closely checked for example Arabica coffee is grown with rubber and areca nut while Robusta coffee with coconut,” he explains. Annually more than 20 ton coffee is produced at the farm. Most of the farm produce is sold through organic farmer’s organization namely Wayanad Social Service Society (WSSS). “WSSS give us better price for our organic produce than the market price. They buy only organic coffee, coconut, pepper, cardamom etc. Price of all products is fixed by them,” Mr. Roy states. Presently Mr. Roy is not processing coffee beans but he plans to start the parchment soon. “Many people think agriculture is not profitable. I want prove it from my life as a farmer that farming is profitable if done appropriately,” he signs off.